Miami Beach is a clean beach with crystal clear water ideal for surfing. The beach is blessed with a lagoon area that features a natural pool perfect to take a dip in. There are quite a few restaurants and bars at the beach too. If you’re looking for a great picnic spot or perfect water for surfing or a good place to entertain your kids, plan a day out at the Enterprise Beach in Bridgetown. Free parking is available at the beach. You can hire umbrellas, sun beds and boogie boards on the beach. The Oistins fishing village is in the neighborhood of Miami Beach. Do not litter on the beach. 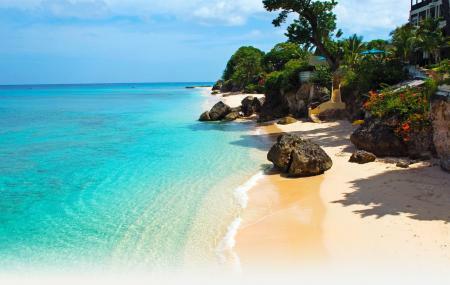 How popular is Miami Beach,barbados? People normally club together Bussa Emancipation Statue and George Washington House while planning their visit to Miami Beach,barbados. Supper low key, very local place. Nice clean beach . Food and washrooms available near by . This an immense attraction place, people came together at any single time during the day swimming and did all funny things their wish. A very good beach. Although there is a lot of garbage around the place. Also, the sand and waves are calm and relaxing. If there wasn’t as much trash, or a happier atmosphere my rating would be higher. Awesome place for hanging out during weekend. The beach is small, the water is clear with calm waves.